Everyone’s talking about the series, Mr Selfridge, and we’re no different! We’re loving it and are putting our feet up this evening to catch up on the latest episode after a long and fun-filled weekend at the Bluewater Wedding Fair. If you fancy having a little bit of Selfridges Edwardian style for your wedding, The Empty Box Company, who made 100 white and green Hat Boxes for the series have a 15% discount off any box order made online until midnight on Valentine’s Day! As well as wedding dress boxes you’ll find all sorts of boxes to use to pack up some of your most treasured wedding memories. Use code VAL13 in the shopping basket to claim your discount. There’s a minimum order value of £30 to qualify. For more info check out their Facebook page! Everyone loves a present so choosing your gift list should be a really enjoyable part of your wedding planning. Depending on your own wants and needs as a couple there are loads of options which don’t include a traditional gift list. Here’s five just to get you started. 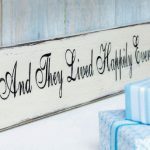 For a wedding list that’s a little bit different take a look at Notonthehighstreet.com which has loads of quirky and unique gifts that guests will be dying to buy you and that you and your home will love forever. If you don’t need anymore ‘stuff’ then how about getting guests to ‘buy’ part of your honeymoon? Buy Our Honeymoon is the UK’s top online wedding list for dream honeymoons, who charge a one-off fee of £55 to manage your honeymoon experience gift list. We caught up with Shelley Green from Buy Our Honeymoon, who told us that “couples can add absolutely anything from room upgrades and a romantic dinner to a day’s scuba diving or a helicopter flight over the Grand Canyon, whatever you want. You don’t have to have made any of your actual honeymoon arrangements prior to building your wedding list though— you can be as general or as specific as you wish. And if you get stuck, we’re happy to help with lots of suggestions”. You can try their website free for a week to see how it works and decide if it’s for you. Smartbox is a unique gift concept which gives you the choice of up to 200 amazing different experiences. Inside a Smartbox there’s an illustrated guidebook with details of the options available and a voucher from your guests. All you have to do is book the experience and hand over the voucher as payment. Bottom Drawer gives your guests the chance to add money to your online fund which you can then turn into a dream present. There’s loads to choose from including holidays, house and garden redesign or just receive vouchers for your favourite stores. The Beyond Weddings Ltd gift service has a whole new take on wedding gift lists. Here you get the chance to work with an interior designer to improve your home on any scale or budget. Which means your guests can contribute to anything from your kitchen renovation to the re-upholstering of your much loved sofa! Whatever you choose it’s like all your birthdays and Christmas’s have come at once – enjoy!